The New England Patriots beat the Los Angeles Chargers 41-28 to reach the AFC Championship game for the eighth consecutive season. They will travel to AFC top seeds the Kansas City Chiefs on Sunday, 20 January, where victory would see them reach a third consecutive Super Bowl. Defending champions the Philadelphia Eagles lost 20-14 to NFC top seeds the New Orleans Saints. The Saints will now play the LA Rams in the NFC Championship game. The winners of both championships will go head-to-head in Super Bowl LIII, which will take place at Mercedes-Benz Stadium in Atlanta, Georgia, on Sunday, 3 February. 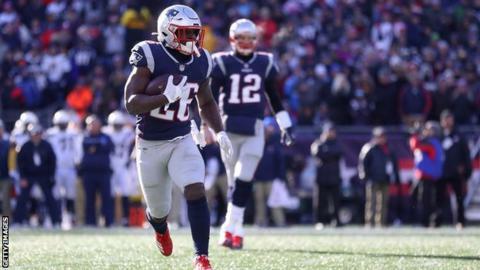 Running back Sony Michel delivered a standout performance at Gillette Stadium with three touchdowns as Patriots quarterback Tom Brady passed for 343 yards. "It was a good win," said the Brady, 41, a five-time Super Bowl champion, who lost to the Eagles in last year's showpiece. On the meeting with the Chiefs, Brady added: "It's that time of year. You've got to play your best. We're one of four left. We've got to get out there. "They are a great team. It should be a great game." The Saints, at home in the Superdome, had been 14-0 down after the first quarter, with Eagles back-up quarterback Nick Foles throwing two touchdowns. But the NFC's top ranked team rallied and eventually took the lead in the third quarter. Quarterback Drew Brees recovered from an interception on his first pass to throw two touchdowns, including what turned out to be the winning score as he found Michael Thomas from two yards. Wil Lutz, who extended the Saints' lead to 20-14 with a 39-yard field goal, missed a 52-yard attempt with just under three minutes remaining, keeping the Eagles in touch. But Alshon Jeffery failed to catch a Foles pass which Saints cornerback Marshon Lattimore intercepted to win the game. "Obviously we didn't start this game the way we wanted to," said 39-year-old Brees, who was named most valuable player the last time the Saints won the Super Bowl in 2009. "They jumped out to a 14-point lead. We were calm, we were poised, we knew we're going to get things going." Saints head coach Sean Payton added: "It wasn't a perfect game. There's a lot of things we have to clean up. But we got the win against the defending champions, and that means a lot. We've played from behind quite a bit in the regular season, and we've been able to come back."